Will the East Bay Embrace Fair Trade? Berkeley and Oakland consider joining the fast-growing Fair Trade Towns movement. A Star Apple client grows food in the front yard. San Francisco, Chico, and even Bluffton, Ohio, are on the official list of Fair Trade-friendly cities, but there are a couple East Bay municipalities that are noticeably missing from the tally. Yet if all goes according to Billy Linstead Goldsmith's plan, Berkeley and Oakland will soon join the international roster of Fair Trade Towns, an effort that started in England a decade ago to raise awareness of ethically sourced products. Thanks to an infusion of cash from Vermont's Green Mountain Coffee Roasters, coupled with what appears to be a growing consumer market — Americans spent $1.2 billion on Fair Trade goods in 2008 — the stateside Fair Trade Towns movement has gotten a boost this year. "We've seen numbers that show that in this economic environment, the ethical consumer category is growing," said Goldsmith, the national coordinator of Fair Trade Towns USA, a product of Transfair USA. "There is evidence of people determined to see the big-picture value of their purchase. If we can show companies the added value we see in making ethical purchases of ethically sourced products, the more impact we can have on the market." There are currently 14 Fair Trade Towns in the United States, and 38 ongoing campaigns (including efforts in San Jose and Palo Alto). To receive an official designation, each city has to meet a number of requirements, including the passage of a government resolution that supports Fair Trade. In Berkeley, a current draft resolution calls for the city to buy Fair Trade products in its offices whenever there are reasonably priced options, and to offer some educational opportunities related to the issue. Additionally, using a somewhat confusing per-capita metric, a specific number of retailers and service providers in each city need to carry or serve Fair Trade products. The bottom line: Berkeley needs 40 stores and organizations to participate, and Oakland needs 120. The participating businesses are then included in marketing and outreach materials. Organizers have been working closely with local businesses to promote the idea — which isn't as counterintuitive as it may initially sound. "Buy local, buy fair is our motto," Goldsmith said. "They're not competing because a majority of Fair Trade products are international commodities. What we want to do is combine messages: Buy everything you can that's locally produced, and those things we don't grow locally, buy on fair terms from a local purveyor." Still, not everyone's putting their money on the Fair Trade Towns approach. "I think these promotions are, in theory, good, but at this point in time in the Bay Area, I wonder how efficient it is because I think that people generally know about these things," said Rick Young, the attorney who introduced the infamous 2002 Berkeley ballot initiative that would have required cafes to serve only Fair Trade, organic or shade-grown brewed coffee (the beans were off the hook). "It may be better for them to put their time and energy into other places." Young continues to believe that mandating Fair Trade products is the way to go. "The more effective way is to consider some sort of law," he said. "If you want to make a bigger impact, you should just require it." Participating storeowners, though, don't seem to mind the extra marketing muscle they're getting from the Fair Trade Towns campaign. "It's good to raise awareness for the consumer — if they have a choice of where they can go, hopefully they will choose to go to a business that does carry Fair Trade products," said Joann Kim, the owner of Yogurt Harmony, which serves Oakland's Numi Organic Teas and Berkeley's Uncommon Ground coffee. "I really appreciate the efforts they're putting into promoting local businesses. It's nice to have a little bit of support out there. It's been a little tough with the economy lately." From window boxes to edible rooftop gardens to backyard livestock, American urban farming is shooting up like a beanstalk through a crack in the sidewalk. In the East Bay, where Alice Waters and Michael Pollan feed our local food obsession, the USDA counted more than 1,150 farms in its most recent agricultural census, and given the growing home farms movement, edible gardens of all configurations seem to be sprouting up all over town. "The country is a lot more environmentally conscious and gardens play into that," said Taja Sevelle of Urban Farms, a Detroit nonprofit that recently installed an urban farm at Bethlehem Lutheran Church in Oakland. "And with the economic downturn, the positive thing that is coming out of that is that people are going back to the basics of, 'Hey, I can grow my own food in my yard — it'll help my grocery bill and it's great for the family and it's peaceful and therapeutic and you know where your food came from.'" With Oakland resident Leslie Bennett's help, there may be even more microfarms prospering from window boxes and front lawns across the East Bay. A suburbanite-turned-city slicker, Bennett never gave a second thought to farming. But when Bennett took a twelve-hour-a-day job to pay off her law school debt, she finally had to come to terms with the fact that she hated her lifestyle. So Bennett quit her job and moved to Jamaica, where she began apprenticing at an organic farm. As time passed, she dug herself more deeply into the farming movement, and she realized that she could take help urbanites like herself reconnect with the earth. "When I switched to farming and gardening, I had this feeling like this was such a great change in my life, and that I can bring this feeling to other sad desk jockeys once they learn how easy it is," she said. Earlier this year, Bennett started up an edible garden service called Star Apple, in conjunction with an organic gardening outfit called Garden Fare (MyGardenFare.com), which provides services ranging from garden design to weekly maintenance to vegetable harvesting. "I have a firm appreciation for just how busy some people are," Bennett said. "There are programs educating people on how to grow food at home, but it can be a big time commitment, and no one offers a maintenance service. So I help them take that first step, no matter how small." 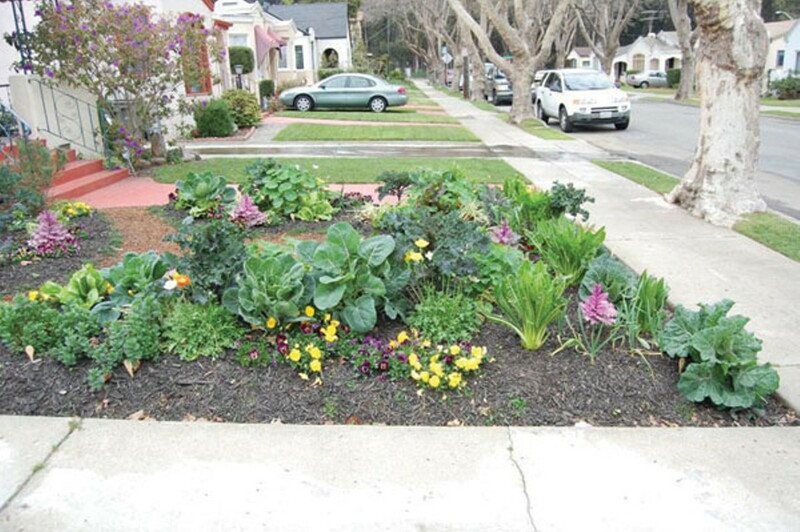 Bennett recently spent a weekday morning removing weeds and harvesting vegetables for a client on 54th Avenue in Oakland. The night before, she and her husband had gone to a client's home at around 11:30 p.m. to remove by hand the slugs that were chewing through the otherwise-thriving stalks of swiss chard. All of the gardens Bennett has designed mix flowers with vegetables, which serves the dual purpose of attracting pollinating bees and adding visual panache. "I spent a lot of time trying to get people into environmental issues and I realized that food is such a great way to get people to connect to the earth," said Bennett, who used to work in public health policy. "Some people don't want row crops of food in their front yard, and people think it's mutually exclusive, but you can make it beautiful." Bennett also sells all-in-one urban gardening kits made out of salvaged wine crates, and she teaches classes on urban gardening at BioFuel Oasis (1441 Ashby Avenue, Berkeley; BioFuelOasis.com), a worker-owned cooperative that's perhaps best known for converting a 1930s gas station into an alternative fuel depot. BioFuel Oasis has itself become an urban farming hub. Novella Carpenter, author of Farm City, is among the worker-owners, and attached to the fueling station is a one-stop shop for urban ag accoutrement: beekeeping supplies (the store also rents out a $750 honey extractor by the day), rabbit feeders, books on rainwater conservation, hay bales, and heirloom seeds. The store also is one of the few purveyors of organic chicken feed in the Bay Area, which is how it all got started in the first place. "There was nowhere to get organic chicken feed, and we, the five worker-owners, were driving to Petaluma and Livermore to get it," said Melissa Hardy. "We started stocking it and we filled a niche. It made sense to throw a fifty-pound bag of feed in your trunk when you come in for your biodiesel. The store rose organically. Sorry for the pun." Urban chickens also have created a new niche for Michael Parayno of Berkeley Rustic Birdhouses (BerkeleyRusticBirdhouses.com), best known for his quirky handmade bird shelters constructed from recycled wood (which are then attached to antique cars and regularly paraded around town). Last year, with urban homesteading in full force, Parayno ventured into chicken coops for city living. "Chickens are just bigger birds," notes Parayno, whose uncle raised chickens on a farm in the Philippines. Parayno makes a triangular European model on wheels, as well as an elevated birdhouse-like coop. Both are raccoon-proof. "You basically need a locked door because raccoons will behead the chickens," said Parayno, who keeps two hens in his yard. "People find out the hard way. They let them go free range and then they forget to put them in at night. Chickens are a different responsibility and commitment. If you go out for drinks and don't put them in the coop, they're gone." The East Bay is a place of plenty when it comes to urban ag-related establishments. Organizations like City Slicker Farms (1625 16th Street, Oakland; CitySlickerFarms.org) and People's Grocery (PeoplesGrocery.org) boost community food security by selling and educating the public on growing organic produce, while restaurants like Zatar (1981 Shattuck Ave., Berkeley; ZatarRestaurant.com) and Taqueria Cancun (2134 Allston Way, Berkeley) serve dishes prepared with vegetables harvested from their own organic gardens. Closings: XOX Truffles (6126 La Salle Ave., Oakland). ... Openings: Mist (1950 Mountain Blvd., Suite 2, Oakland), an airbrush tanning salon; Sola Lucy (Village Square, Suite 150, Oakland), a woman's clothing store; Yogofina (6140 Medau Pl., Oakland), a yogurt shop. ... Also: The Beauty Art Salon (6136 Medau Pl., Oakland) changed its name to The French Cowgirl Salon and now sells women's western apparel. Retail Tour: Danish and American modernist furnishings. Bayfair Center devises a clever program to assist entrepreneurs and recruit tenants. Plus, specialty groceries. Plus one-of-a-kind businesses and this month's retail news. A new study finds that global warming likely will affect poor, urban, and minority residents the most. Plus, going green pays off for companies.